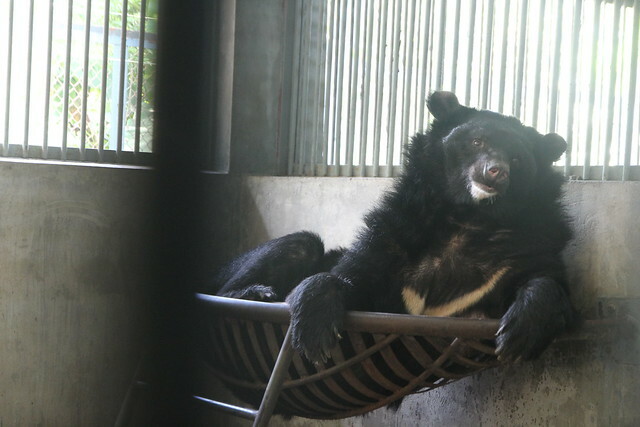 Moon bears Star, Mai and Mekong were kept in tiny cages for 13 long, lonely years. Confined and helpless, they survived on what little food and water was given to them and never had any opportunity to live like bears. They never foraged on grass, never met other bears, never climbed or swam or ran. They simply sat in painful isolation waiting only for their bile to be periodically extracted for use in traditional medicine. But since being rescued in August this year as part of the #FiveLives rescue, all three now live at Animals Asia’s Vietnam sanctuary and their rehabilitation is well underway. Already they have finished quarantine and received the health care they so desperately needed. They are learning to forage for food as they would naturally in the wild and every day their dens are filled with items to help them express their natural behaviours. And recently life got even better as the bears were introduced to each other so they could bond to find playmates, and solace, in each other. When Star and Mekong met for the first time, the two large males became best friends straight away. They spent a long time wrestling together, before both collapsed in happy exhaustion. While they wrestled, diminutive female Mai was separated in the next den and she started becoming a bit worried – probably because she could hear the commotion but couldn’t see what was happening. When the door opened, she went straight in to reassure herself that the other bears were ok, had a quick wrestle with Star, and immediately calmed down. She spent the rest of the morning sweeping the floor for left-over treats and building a nest in the corner of her den, while Star and Mekong played nearby. 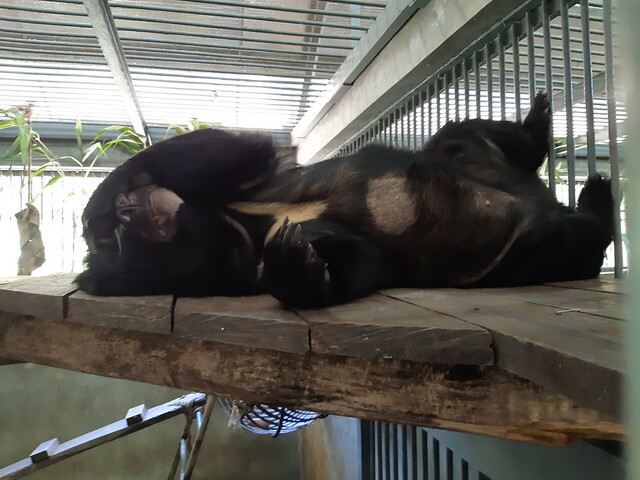 In this group, Mai has quickly assumed a position as the “mamma bear” – always checking in on what the boys are doing and sweetly nuzzling them. When Star gently stole a piece of pumpkin from Mekong one dinner time, Mai immediately started to try and get it back for him. It’s fair to say that all three bears are relishing each other’s company and the endless stimulation and comfort that they bring to each other’s formerly lonely lives. “Star and Mekong love to wrestle, with little Mai always watching on. Sometimes the two boys get a bit excited over food or enrichment and Mai gently steps in between them to calm them down. She is like a mamma bear always looking out for them. “Mai and Star love to build nests, but poor Star often needs to rebuild his as the other two like to steal his materials. The other day, Star had made a cosy nest with a hessian sack and was curled up asleep when Mekong crept up and pulled the hessian sack out from under him! Star left the den in search of more nesting material and found a palm broom which he started arranging nicely. But then Mai heard the noise and tried to steal that from him too! As she is such a short wee bear and Star was in the basket, he was much better at keeping it out of Mai’s claws. “Star is also an excellent problem solver, and when given new enrichment he is always the fastest to figure it out. Mai is a little mother hen to these boys. Whenever they are upset she clucks to them, follows them around and often nuzzles into them. Star, Mai and Mekong were rescued alongside Kim and LeBon. So far Kim and LeBon have met but seemed to prefer to live separately for now. Their carers are searching for existing communities more suited to their individual personalities. The team expect that in time, LeBon and Kim will be sharing their lives with other bears.